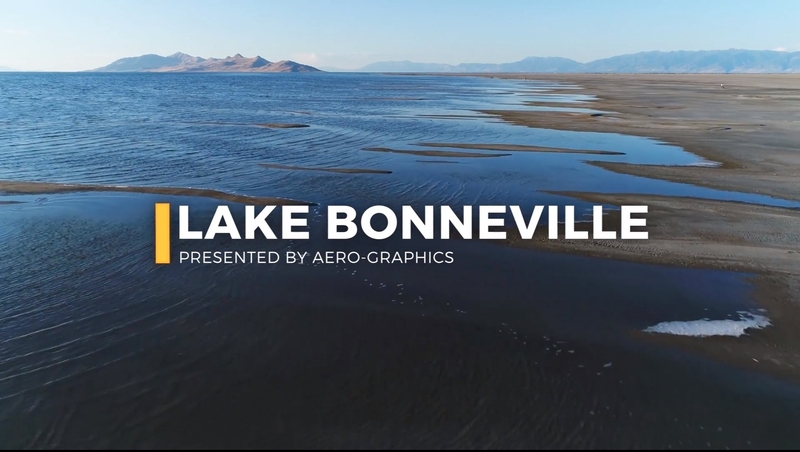 Short informational video animation of the rise and fall of Lake Bonneville. Earth scientists and educators working to preserve very unique and endangered geomorphic landforms in the Salt Lake City, Utah area. Produced by Doug Prose and Diane LaMacchia. Funding by the National Science Foundation. This year’s Earth Science Week at the Utah Geological Survey welcomed 669 students for hands-on, educational fun! We learned about rocks and minerals, fossils, dinosaurs, geologic processes, and more. Thank you for another fabulous Earth Science Week – see you next year! Teachers click here to learn how to make reservations. Utah Geological Survey geologist Michael Vanden Berg teamed up with individuals from Loma Linda University to fly a drone/GoPro over the microbialites/bioherms in the shallow waters of Great Salt Lake on the northwestern tip of Antelope Island. The shallow waters of Bridger Bay, on the northwestern tip of Antelope Island in the southern arm of hypersaline Great Salt Lake, support extensive microbial carbonate formation, especially in the north-northeast portion of the bay near Egg Island. Lake levels in the fall of 2014 were near 60-year lows (as low as 1278.1 m [4193.3 ft] above mean sea level, compared to the near-term historic average of about 1280 m [4200 ft]), giving unprecedented access to the microbial structures. Characterizing the microbialites of Bridger Bay, including facies delineation and aerial extent, can inform interpretations of similar deposits in the ancient rock record (e.g., Eocene Green River Formation), including potential petroleum reservoirs. Utah Geological Survey paleontologists Jim Kirkland and Don DeBlieux assisted a crew from Utah State Parks & Recreation in moving a large petrified tree to the Escalante Petrified Forest State Park for display. The park received permission from the Bureau of Land Management (BLM) to move the tree from land the BLM manages just outside the town of Escalante, and park personnel called in UGS paleontologists to consult with and oversee the move. Several pieces of heavy equipment were needed to lift the log, which was already separated into sections, onto a flatbed truck for the several-mile drive to the park. Eighteen sections were moved, including the base of the tree that was estimated to weigh over 2 tons, and lifted back into place in the sand-filled concrete enclosure that had been constructed to house the tree. The park is known for its large number of petrified logs eroding out of the 150-million-year-old Morrison Formation. These logs are found on a plateau above the park entrance that can only be accessed by a fairly rugged hike, so not all visitors will have the time or the ability to see them. By having a large petrified tree on display near the visitors center, many more people, including those with physical challenges, will be able to view and learn about the fossils found in this region. The cooperation of the BLM and State Parks for the benefit of Utah citizens and visitors was well exemplified during this project. Nearly 900 students, teachers, and parents, rotated through hands-on activity stations to experience 90 minutes of earth science during Earth Science Week at the Utah Geological Survey. Utah Geological Survey paleontologists ran into a flash flood at Yellow Cat Wash as they were leaving the Stike’s dinosaur excavation. They had to wait about 3 hours before they felt confident they would get through safely. Follow some of the Utah Geological Survey’s paleontologists and volunteers as they explain the geology and the discovery and extraction process of dinosaur fossil bones at the Doelling’s Bowl dinosaur site. Discovering a new type of geothermal resource: Basin-centered reservoirs. Discovery of a new type of geothermal energy resource in Utah offers hope for significantly more potential across the western U.S., and a boost in geothermal power production. In 2011 and 2012, Utah Geological Survey geoscientists, in partnership with a U.S. Geological Survey research drilling crew, drilled nine temperature gradient holes in Utah’s Black Rock Desert basin south of Delta in western Utah to test a new concept that high-temperature geothermal resources might exist beneath young sedimentary basins. Preliminary results show that near-surface temperature gradients in the basin vary from about 33°F/1000 feet to 55°F/1000 feet. This implies temperatures of 300 to 500°F at 10,000 to 13,000 feet depth beneath the basin. Given the large area of this basin, the power potential is conservatively estimated to be hundreds of megawatts, and preliminary economic modeling suggests a cost of electricity of about 10c per kilowatt-hour over the life of a geothermal power project. This basin is especially attractive for geothermal development because of the existing nearby infrastructure ─ it is next to a large coal-fired power plant, a 300 MWe wind farm, and a major electrical transmission line to California. A 3-minute, time-lapse video, taken over 10 days, showing the excavation and investigation of the North Creek trench on the Nephi segment of the Wasatch fault zone. Past large earthquakes on the central, most active segments of the fault and how geologists interpret evidence of large, prehistoric earthquakes, with footage from the North Creek trench investigation. The Wasatch fault is Utah’s longest and most active fault, extending along the Wasatch Front from southern Idaho to central Utah. Although no large earthquakes have ruptured the fault historically, abundant geologic evidence indicates that the fault is capable of generating earthquakes as large as magnitude 6.5–7.5. This video takes you along the trace of the Wasatch fault, showing its proximity to cities and towns in the Wasatch Front region, and also highlighting the history of past large earthquakes on the central, most active segments of the fault. The video also includes footage from a recent trench investigation at the North Creek site on the Nephi segment of the fault, and describes how geologists interpret evidence of large, prehistoric earthquakes. Highlights the Salt Lake City segment of the Wasatch fault, which traces along the eastern side of Salt Lake Valley, and related geologic features. This flyby video highlights the Salt Lake City segment of the Wasatch fault, which traces along the eastern side of Salt Lake Valley. The 240-mile-long Wasatch fault is sectioned into 10 segments averaging 25 miles in length. In addition to showing where the fault is and its proximity to highways and towns, photos are included that show fault scarps and other geologic features. The audio portion covers the geologic story of the Wasatch fault, as well as some of today’s concerns about the earthquake hazard the fault poses to this heavily urbanized area of Utah. To guess where this area is, look carefully at the water bubbling up and the rock formation surrounding it. Did you guess the "Spot the Rock" location? Click here for answer. The correct answer is Crystal Geyser! Crystal Geyser is located on the eastern bank of the Green River approximately 3.5 miles downstream from Interstate 70. It is a geologically unusual site to visit, as it is a cold-water, carbon-dioxide-driven geyser as opposed to the geothermal geysers you would see at Yellowstone. In the past, Crystal Geyser’s eruptions were notably higher and more frequent than what they are today. As seen in the video the entire area is draped with beautiful travertine (calcium carbonate) which makes it a gem of a place to put on your bucket list. It is a mysterious place where hissing and bubbling ground can be found. Be sure to turn up your volume to listen to it boil and toil. For those of you that guessed Roosevelt Hot Springs, you are correct! Roosevelt Hot Springs Geothermal Area is located at the western edge of the Mineral Mountains, approximately 15 miles northeast of the town of Milford, Beaver County. The Roosevelt Hot Springs geothermal field has been utilized for electricity production for nearly 30 years. The electricity is produced by extracting hot water from deep wells, using this heat to power steam turbines, then re-injecting the water back into the ground. Near-surface water levels have dropped over the past three decades, creating a steam zone which is evidenced by the hissing ground seen in the video. Lake Bonneville through time using Flash animation. Includes information on Lake Bonneville and life in Utah during the latest Ice Age in Utah. 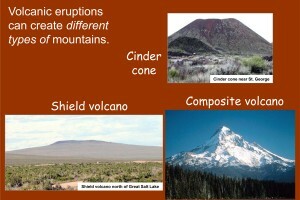 Students will understand that volcanoes, earthquakes, uplift, weathering, and erosion reshape Earth’s surface. Based on fifth grade science concepts from core curriculum.